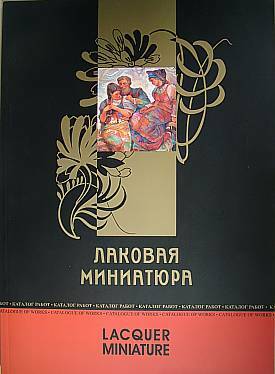 Written in both Russian and English, this large softcover book focuses exclusively on Fedoskino art and some of the top artists there. An introduction by E. Osipova starts the book off, and it is followed by 159 gorgeous color pictures of contemporary Fedoskino art. There is also a biographical section with pictures and information about the 40 artists featured in the book. 94 pages. Artists include: Yu. Aldoshkin, E. Aldoshkina, S. Antipov, A. Antonova, M. Belova, S. Belovodova, O. Borisova, K. Buyko, Yu. Valyalin, K. Danshin, Yu. Danilina, V. Domakhin, S. Kirsanov, I. Leitland, V. Maslov, Yu. Mikhalev, A. Mikhaleva, A. Mikheev, V. Monashov, N. Orlova, D. Osipov, M. Papenov, S. Parmenov, L. Pashinina, A. Puchkov, A. Pyastolov, D. Rogatov, M. Ruzheinikov, V. Svyatchenkov, A. Sedov, D. Sedov, P. Sennitsky, A. Simonov, N. Soloninkin, A. Tashlykov, L. Titova, I. Turbeneva, N. Khizhnyak, S. Khrustleva, M. Shelukhin. Just one left! Please note that this last copy has minor wear from shipment, but is new.